One mistake I made early on was subscribing directly to our talent tracking board. And then when I installed the Trello iPhone and iPad apps it became unbearable. I was sitting in a meeting when suddenly my phone, tablet and laptop were all beeping like crazy. Someone was doing a bunch of updates and I was being told about everything on every device. So, I did what most people would do. I just turned off the notifications on my devices. As we started using Trello, we found ourself still sending emails to each other to nudge us along. Frankly I felt the notification system was broken. And tweeted to that effect as shown above. Unsubscribe from all boards. This was a big mistake on my part. I had subscribed to the board itself. This created an enormous amount of noise and was why I ended up turning all notifications off and led to me missing the power of trello notications. Subscribe only to cards that you really want notifications on. Remember you will get pinged every time that card moves to another list or any action happens on the card. Make sure you want that to happen. Assign yourself to a card only when you are really responsible for the card. Don’t use this as a means for getting notifications. That is what subscribe is used for. Remember, notification is a by-product of assigning yourself to a card or being assigned to a card. There are several different avenues of notification. Understanding them and deciding on what is right for you is key to being happy and productive with Trello or being frustrated. This one happens automatically. When you visit the Trello board (on whichever platform) you will see a red alert icon signaling you have notifications. You will also see alerts on individual cards. Download the iOS or Android Trello app and make sure you turn on notifications. You can customize this through the normal phone OS settings. This is the most effective way to ensure you don't miss a notification. But it can be noisy. You will want to play with how the alerts are shown on your device. Go to your Trello Settings page and enable the “Allow Desktop Notifications”. This will allow Trello to be able to use the normal desktop notification system on you laptop’s OS. This is really effective during the day at work. Clicking on desktop notifications takes you directly to where the notification originated. 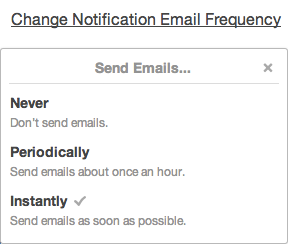 For this one you can set the frequency of email notifications. Don't use assigning someone to a card as a means of notification. Assignment means responsibility for the card. If they are responsible, then yes they should be assigned or assign themselves to the card. Just know that notifications will come on any activity on the card. If you ensure that, I believe Trello is a really powerful tool for managing a workflow without having to resort to email. It feels pretty natural for managing a talent pipeline.